"Jungle Paradise is perched by picturesque hills and wild mango grove forests on the other providing astute luxury and comfort in the wilderness. " The Jungle Paradise Retreat offers a breathtaking rendezvous with the wild flora and fauna of the JIM CORBETT NATIONAL PARK known for the scenic beauty of its magnificent sub-mountain and riverine landscapes, this retreat is perched by picturesque hills and wild mango grove forests on the other providing astute luxury and comfort in the wilderness. 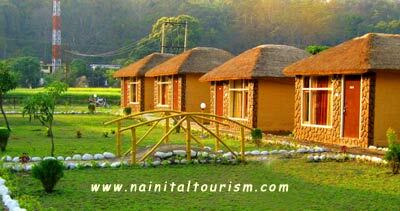 A scenic assortment of 14 spacious mud cottages with adjoining baths in a grove of mango trees. With bamboos and a blend of mud done on the interiors and typical thatched roofs, gives a total vibrant environment.The rounded circular hut and dining area, make it an intrinsic part of the hills around it. * Activity Centre - Arrangements for games like Chess, Carrom Board, Badminton, Tennis Cricket & more..
* Outdoor Adventure - Arrangements for Rock climbing, Parasailing/Paragliding, Rappling, River crossing, Angling, Swimming in river Kosi. * Relaxing Hammocks under the shade and sun. * Souvenir Shop - The finest and natural chosen souvenirs and gifts from the surroundings of Corbett National park and of the kumaon. Road: Jungle Paradise is 265 -kms from Delhi and 7-kms from Ramnagar. The route from Delhi spans Hapur-Gajraula-Moradabad-Kashipur-Ramnagar. 1. Corbett Link Express departs from Old Delhi Railway Station at 2245 hrs and arrives at Ramnagar at 0530 hrs. 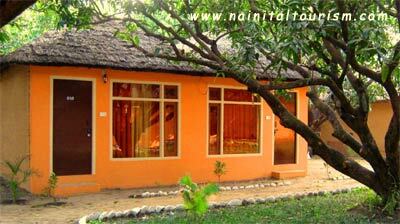 It is another 7 Kms by taxi to JUNGLE PARADISE RETREAT. The train has one A/C coach and the rest are Sleeper Coaches. 2. Kathgodam Express departs from Old Delhi Railway Station at 2245 hrs, arriving at Kathgodam at 0715 hrs. 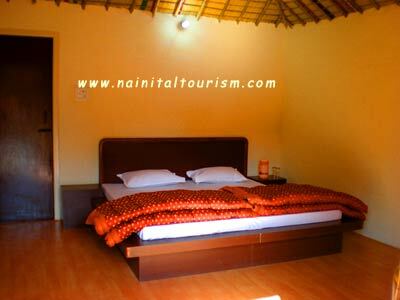 It is another 66 Kms by taxi to JUNGLE PARADISE RETREAT. The train has one A/C coach and the rest are Sleeper Coaches. � OnLine Technologies. All rights reserved.